In a broad sense the Planning Commission is responsible for thinking ahead, with the help of Middlesex residents—for envisioning what we all want our town to be like in the future and then helping to make that happen. In addition, the Planning Commission may study and make recommendations on land development, transportation, energy conservation, and many other related matters. The Planning Commission makes a strong effort to contact town residents about meetings where citizens can provide input, and includes news in many issues of the Middlesex Monthly. Planning is the process of designing a community’s future. Zoning is the process of regulating proposed uses of property, so as to fit with the plan that the town designed. 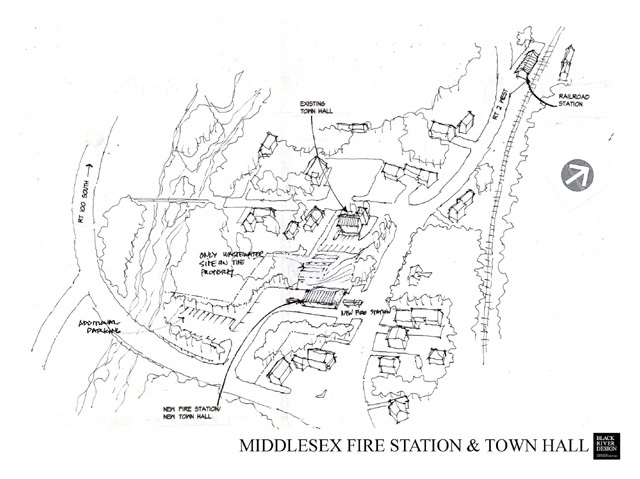 In Middlesex, the Town Plan is developed by the volunteer Planning Commission, with input from citizens. After a public hearing, the plan is then referred to the Select Board, which also holds a hearing. 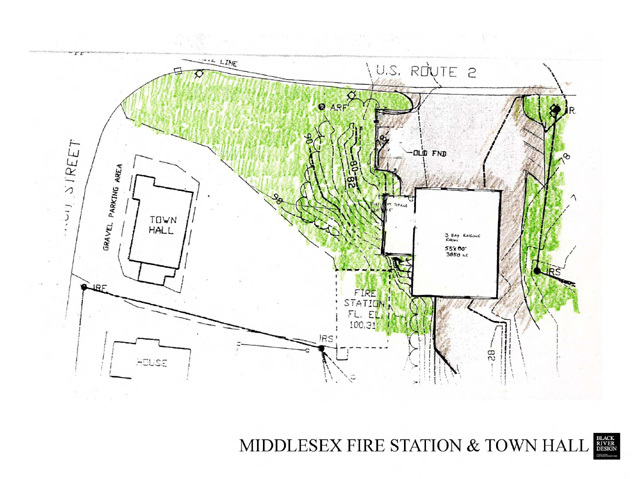 In towns that so choose (and Middlesex has been one), the Select Board then sends the plan to the voters for approval. The Town Plan may include recommendations for both voluntary and regulatory actions. It is also used as a benchmark in certain Act 250 proceedings. The plan is updated and readopted every five years. The Planning Commission is also charged with preparing Zoning Bylaws or amendments to implement the town plan, which are adopted in a similar fashion. There is a specific process for Zoning Bylaws or amendments (Planning Commission Reporting Form for Municipal Bylaw Amendments). Stop by the Town Office to take a look at a copy of your Town Plan. It is updated every five years, so if there’s something in it you’d like to see written differently, there are regular opportunities to change it. The Middlesex Conservation Commission’s mission is to conserve the town’s natural and cultural resources. The Conservation Commission works with the town’s other governmental entities and the public to identify and assess resources, to offer the town and landowners guidance on planning for the conservation of these resources, and to educate the residents of Middlesex as to why conserving these resources is so important. Updates on the Commission’s work appear regularly in the Middlesex Monthly. Since mid-2001, the Town Meeting Solutions Committee has come together once a month to research, discuss and take action to increase and improve participation in Middlesex’s Town Meeting. This ad hoc group was not appointed, but simply gathered at the request of the Select Board. Photo: The Town Meeting Solutions Committee enjoys the magical balancing act of local democracy. 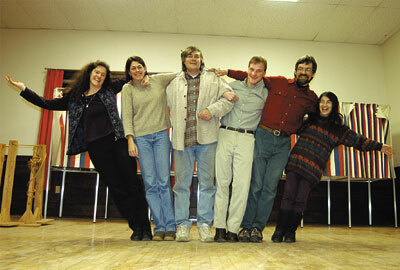 Some of the members, above: (l-r): Susan Clark, Kelly Ault, Greg Whitchurch, Wilson Brett, Dave Shepard, Barb Whitchurch. Photo by Mark Bushnell. 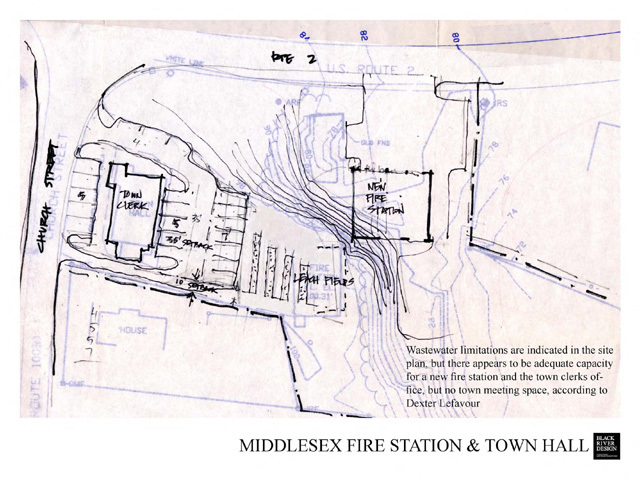 The preliminary report of the Middlesex Municipal Overview/Study Committee (Facilities Committee) was presented to the Select Board in June 2006, and the meeting was attended by interested citizens. Selections from the report are included here. The public is encouraged to look over the complete document at the Town Hall. The Select Board invites comments from Middlesex citizens, and will be holding hearings on this topic in the future. The table below is the report broken down into PDF files for downloading. The Municipal Overview/Study Committee has been working since the fall of 2004 with John Rahill, of Black River Design, Architects to review the Town’s upcoming building needs. This report reflects the research by John and the recommendations of the committee members, who spent many evenings reviewing information and ideas about the future of our buildings and institutions in the town of Middlesex. Explore options available to the Town, with an eye toward achieving efficiencies through sharing of facilities. Provide rough cost projections for the selected options and potential grants/funding. The Committee met four times over the Fall and Winter to review and discuss the needs and possible solutions to the existing space problems. We have taken the somewhat bold step of adding up all the costs of the new construction and renovation options that are needed by the town. Although these costs will almost certainly be inaccurate, since we are too early in the specific discussions about the individual projects, it is useful to see the comparative costs of different solutions, and the savings that can potentially be realized by creating spaces with multiple uses. For this reason, the individual costs for each project solution should be viewed as preliminary. Every year building costs go up, so these numbers need to be evaluated each year. Recently the construction cost inflation factor has been 5-10 percent per year. The vault is getting overcrowded and additional space is needed for the Listers and their files, and the Selectmen’s meeting room. We explored several options. New Town Offices on 2nd level above new Fire Station. New Town Offices on new site (not yet selected). Initial cost projections range from $277,000 to $535,000 for the town offices (plus the cost of land if it needs to be purchased and any site development costs). New Station on land owned by the Town in back of the existing Fire Station. Combined building with Town Offices on same property. possible due to wastewater disposal requirements for 300 people). Initial cost projections for the Fire Department are in the range of $1 million to $1.25 million, depending on the size and the septic requirements. It should be noted that wastewater capacity appears to be very limited on the land owned by the town between the existing fire station and the store. This will almost certainly limit the ability for a new Town Meeting space to be constructed on this site, and it may limit the community uses of a fire station. The Road Department has several relatively small, short term needs, but has budgeted for these needs over the past several years and construction work is expected this year. to the capacity of the existing town hall at 170±. Building a new space above a new Fire Station on the land owned by the Town to the East of the existing Fire Station and Town Hall property. Building a new Town Meeting place on a new site (not a recommended option). Initial cost projections range from $70,000 to $550,000 for the Town Meeting Hall component. Purchasing and renovating the Railroad Station in the Village. Moving into the Town Hall, when or if the Town Meeting space or Town Offices move to a new location. Initial cost projections range from $90,000 to $305,000. building solution will be smaller or larger and costs will be have to be adjusted accordingly. methods, material and finishings are better defined. Cost estimating is a difficult task, especially looking far out into the future. The costs stated here are almost surely off to some degree, but they should show the comparative costs of various solutions quite well. If one building solution is less expensive today, it will probably be less expensive in five years.